WATERFORD, Conn. -- The Tufts University men's cross country team came up with its best race of the season in the biggest race so far, finishing third at the 2007 NCAA Division III Northeast Regional Championship hosted by Connecticut College on Saturday. Tufts will now await word on an at-large berth to the NCAA National Championship Race, which is next Saturday (Nov. 17) at St. Olaf College in Minnesota. Their third-place finish at the regional race greatly enhances their chances for a national berth. 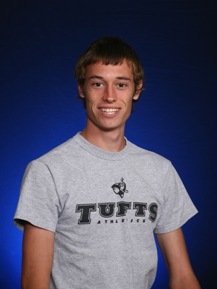 Tufts was led by a sensational performance from sophomore Jesse Faller (Burlington, MA), who was third individually with a time of 25 minutes, 4.0 seconds over the eight-kilometer course. He was just nine seconds behind race winner Edgar Kosgey from Williams College, who had a 24:55.4 finish. Senior tri-captain Dave Sorensen (Dover, MA) took 11th place with a 25:11.3 time, and senior tri-captain Chris Kantos (Apple Valley, MN) also scored high for Coach Ethan Barron's Jumbos with a 25:14.2 for 16th place. Sophomore Nick Welch (Seattle, WA) scored fourth for the Jumbos and 31st overall in 25:31.3. Freshman Greg Pallotta (Syracuse, NY) contributed in his first NCAA regional championship performance with a 74th-place effort (26:11.7). Tufts accumulated 135 points to safely take third place behind regional champion Amherst (117 points) and Williams (118 points). Tufts is looking to make its ninth team appearance at the NCAA Championship overall.